New Orleans is not easy to find a good place to eat on certain days and at certain hours. Many restaurants close between Sunday and Tuesday, and when it comes to dining late at night, pickings are very slim, especially for thoughtful, wholesome fare. Enter Cleo’s Mediterranean Cuisine, a grocery store and restaurant, which is open 24 hours a day seven days a week. More important than its convenient hours is its cuisine. Cleo’s offers, by far, some of the best, authentic Middle Eastern fare in the city. The extensive menu ranges from breakfast items to numerous appetizers, soups, salads, seafood and vegetarian plates, as well as sandwich versions of many of popular items, including falafel, gyros, kebabs and shawarma and the price is hard to beat. The proprietor of Cleo’s decided to expand to a second location on the edge of the French Quarter in the old Café Giovanni location. The design challenge was to transform the dining room from old world Italy to modern Egypt. 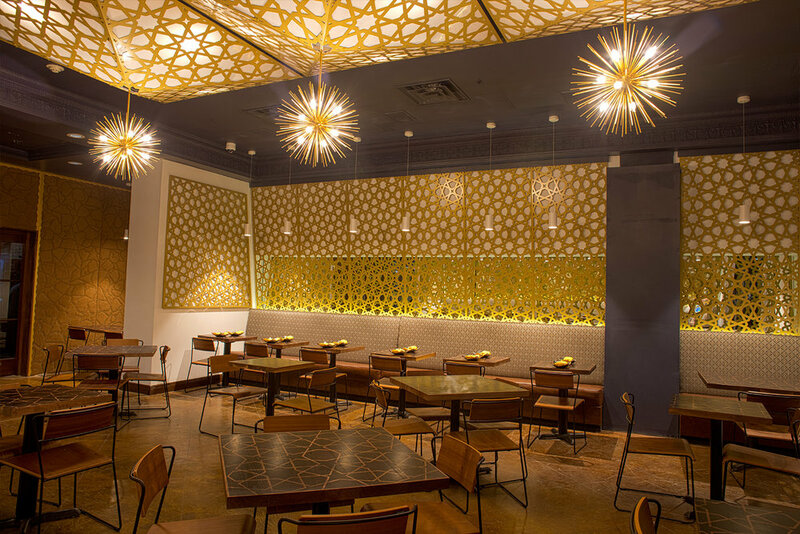 The design concept relies on Islamic geometric patterns to create space, develop textures, and create a unique aesthetic inside the context of the French Quarter. Curated patterns realized with contemporary means and methods adorn the ceiling, walls, and furniture to immerse patrons in a culture half a world away. The Maqsure pattern from The Great Mosque of Cordoba was selected for the ceiling and wall features because the scale and density of the pattern is significant enough to be transformative while maintaining enough transparency to create visual depth. The ceiling and wall features were fabricated using powder coated metal, so the pattern can be implemented vertically or horizontally. A pattern from The Great Mosque of Kairouan was selected for the tables because the pattern creates a focal point for patrons to gather around. 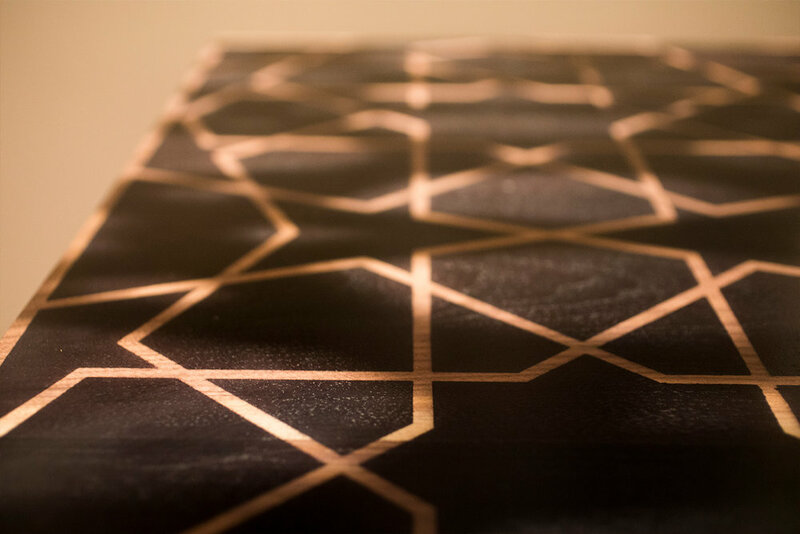 The tabletops were fabricated out of walnut and the pattern was burnt into wood. Each pattern element is fully custom and fabricated locally.